The argument that religion suppresses rational inquiry is often based on the idea that “reason” and “revelation” are opposites. On this view, shared by atheist crusaders and some believers as well, the whole point of the Bible is to provide divine knowledge for guiding our lives, so we don’t need questioning and independence of mind. 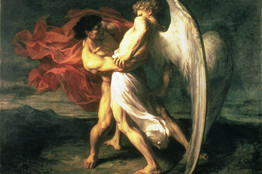 Musee des Beaux-Arts/Clermont-Ferrand, France/Roger-Viollet, Paris/Bridgeman Art Library Independent thinker: ‘Jacob Wrestling with the Angel,’ 1865. This dichotomy between reason and revelation has a great deal of history behind it, but I have never accepted it. In fact, as an Orthodox Jew, I often find the whole discussion quite frustrating. 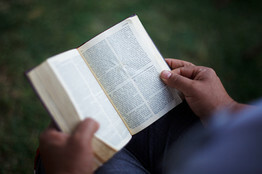 I will let Christians speak for their own sacred texts, but in the Hebrew Bible (or “Old Testament”) and the classical rabbinical sources that are the basis for my religion, one of the abiding themes is precisely the ever-urgent need for human beings, if they are to find what is true and just, to maintain their capacity for independent thought and action. Almost every major hero and heroine of the Hebrew Bible is depicted as independent-minded, disobedient, even contentious. Abraham, Isaac and Jacob, Joseph’s brothers, Moses and Aaron, Gideon and Samuel, prophets such as Elijah and Elisha, and exilic biblical figures such as Daniel, Mordechai and Esther—all are portrayed as confronting authority and breaking the laws and commands of kings. And for this they are praised. But aren’t these biblical figures just disobeying human institutions in response to commands from on high? Not at all. Very often the disobedience we see in Hebrew Scripture is initiated by human beings with no word from God at all. Thus the midwives Shifra and Pua resist Pharaoh’s decree to murder the Israelite children in the Exodus narrative. And Moses’ mother and sister hide the infant boy, although it is against the law. And Moses grows up and slays an Egyptian who is beating a Hebrew slave. independence of mind only with respect to other human beings, and that they become pushovers when God enters the picture. But that isn’t right either. Many biblical figures dare to extend their arguments and criticism to God himself. Abraham is famous for challenging God over the fate of Sodom: “Will not the judge of all the earth do justice?” Moses repeatedly argues against God’s intention to destroy Israel. David is outraged over what he sees as God’s unjust killing of one of his men, and similar arguments with God appear in Isaiah, Jeremiah, Ezekiel, Havakuk, Jonah and Job. Nor do these biblical figures stop at just arguing with God. They also disobey God. Abel disregards God’s instructions to go work the soil, while his brother Cain obeys—yet it is Abel whom God loves, not Cain. Moses, too, directly disobeys God’s command to lead the people up to Canaan after the sin of the golden calf. Aaron refuses to conduct the sacrificial service as commanded after God kills his two sons. The daughters of Tzelofhad even demand that Moses alter God’s law because they deem it unjust. And in all these cases, the biblical narrative endorses such resistance. Reread that last sentence. It says that the God of Israel so cherishes independent-minded men and women that he himself names them Israel, meaning “will contend with God,” as a sign of his love and esteem. Perhaps it is time for the participants in the great “religion wars” of our day to give the Hebrew Bible another read. —Dr. Hazony is the author of “The Philosophy of Hebrew Scripture,” which has just been published by Cambridge University Press.